Find us on FB . Thinking of booking privately ? It can save you £££'s especially in the summer and often a lot of extras like games/DVD's that you wouldn't get going direct . 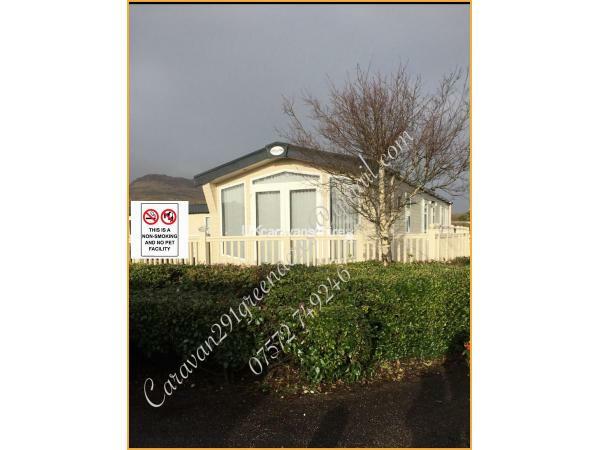 Modern and homely 3 bed holiday home in a quiet & respected area on Greenacres. Open plan living and kitchen, the kitchen is offset with a little island. Shower 2 toilets. 3 bedrooms . Lots of living space. We are very family orientated. We have decking that has a gate at the side and front. Seating on the decking and a small table and 2 chairs off the decking . * 3 bedrooms (maximum 6 people ) 1 Double room & 2 twin rooms that the beds can be placed together to make a double . * French doors onto the decking where the afternoon sun catches lovely . * Electric flame effect wall mounted fire . * Eye level oven with grill and integrated microwave with a separate hob and over head extractor . * Large shower with fan extraction in the main bathroom & a 2nd toilet/hand basin next door . *40 inch free standing TV in the living room with sky via free sat or freeview. We also have a good selection of books ,DVD's and games . Single beds can be moved together by moving the small bedside cupboard to form a double bed . Central heating from mains gas which is monitored for fair usage . Radiator in each room with a 24 hour timer . This is to ensure time for checking all is ok and changing bed protectors ect . Late bookings must have 2 clear weeks to allow forms to be sent out to you . As this is too late to use Haven for the key service a key box is used and code will be sent 2 hours before entry time . Greenacres is a Haven site with lots do do both on site and off site. We have black rock sands that you can walk onto from the site. Porthmadog town has the harbour, steam railway, lovely array of shops ,super markets. We are a good base for visiting some beautiful places. The site is kept very clean and tidy. Bus stop on site that runs to Porthmadog town. Terms & conditions are sent with a booking form, whilst we want the booking process to be as easy as possible we do need to provide these for both yourselves and us too. Only the persons entered on the booking form will only be permitted to stay . We stayed in this caravan with 2 chidren age 5 & 3 and they didn't want to leave it had everything we needed .Amazing location close to the complex but not within site . Beach was amazing .All round easy process to booking and taking our holidaor y . Thanks for having us we will be back . Wow what can I say we stayed for a week with our two children 12 and 14 the caravan is beautiful with everything you could need and more . And the lovely lady we rented off Kath couldn't of been more helpful have already rebooked. Stayed for a week in September with 2 young children . Lovely and clean and very comfortable with all the extras , the children didn’t want to leave . Games and DVDs were a bonus that we never had booking direct . We will be returning . Thank you for your feed back , glad you had a nice time .Your welcome back anytime .